The building of a highly respected Roman Catholic church in northern Isreal has been set on fire and offensive slogans have been scribbled on one of its walls by suspected extremists. This video grab shows a burnt section of the Church of the Multiplication of the Loaves and Fish on the northwestern shore of the Sea of Galilee, Israel, on June 18, 2015. Two people were also taken to hospital after inhaling thick smoke that had filled the area. He added that an investigation has been launched into the incident. The Church of the Multiplication of the Loaves and Fish is greatly cherished by Christians, and serves as a traditional site of pilgrimage in Israel. 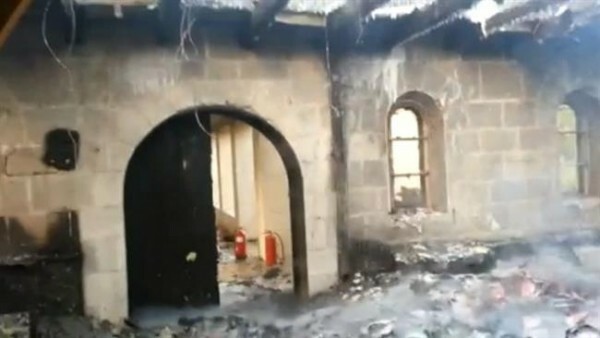 Earlier this year, a seminary building belonging to the Greek Orthodox Church was torched in East al-Quds (Jerusalem) in a hate crime attack by Israeli extremists. The extremists torched an annex of the church building on February 26, writing graffiti that insulted Jesus Christ. No one was injured or killed in the sacrilegious incident. The act of vandalism came a day after a mosque was set ablaze in the village of al-Jaba near Bethlehem in the occupied West Bank. The attackers sprayed anti-Muslim slogans on a nearby wall. Israeli extremists have recently intensified attacks on Christian and Muslim holy sites in the occupied Palestinian territories. They have also desecrated al-Aqsa Mosque on numerous occasions with the support of the Israeli security forces. Israel has tried to change the demographic makeup of al-Quds over the past decades by constructing illegal settlements, destroying historical sites and expelling the local Palestinian population.